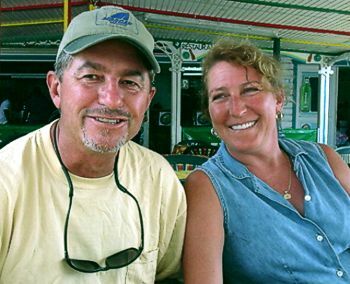 Chris and Robin have owned Sopris since 1992 and would love to welcome you aboard their pride and joy the Sailing Vessel SOPRIS. As your personal crew, our goal is to make yours the ultimate vacation whether it’s a Daysail or a Week long adventure. Whether your preference is slow and laid back in a quiet, secluded cove watching a fabulous sunset; or fast paced, sailing the Caribbean and dancing to one of the local “jump-ups”, we pride ourselves in providing you best vacation ever. Your Captain and host aboard Sopris, is licensed by the United States Coast Guard. For the past 30 years he has held a 100 ton Master’s License and is an expert free diver/snorkeler along with being an accomplished certified Scuba diver. 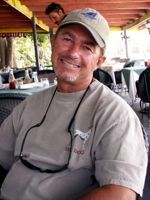 Chris has lived in and worked as a Captain in the Virgin Islands since 1980, he knows the best spots, the quiet anchorages, great local nightlife, the perfect snorkeling, most beautiful beaches, and the best shopping, “Chris knows where to find it”! Chris loves sharing his knowledge of the Caribbean and Sailing with all aboard Sopris. 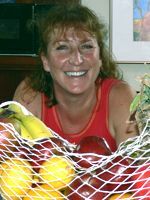 Your chef, hostess, and snorkeling guide, is as comfortable in the galley as she is in the water. Her fabulous gourmet meals will leave your palate in heaven. Robin is an expert free diver and snorkeler plus an accomplished underwater photographer. Robin loves sharing her enthusiasm for snorkeling and marine life, whether it’s finding the most elusive creatures or playing with the friendly sea turtles “Robin knows the best spots”! Robin loves personally showing you the many coral reefs and their colorful worlds abounding with fish. Being married since 1990, and best friends for life, you’ll find the team of Chris and Robin the ideal host and companions for your dream vacation, whether it’s for a day or a week. Give us a call today to make your reservation!